In a strange and even surreal final in front of a screaming home crowd in Espoo, Finland appeared to win the IIHF World Championship over the United States in overtime … but then their goal was disallowed and the U.S. won in the shoot-out. Really? Yes, this happened, somehow. In the prior 18 championship finals, only the U.S. and Canada had played for the title, but Finland pushed aside Canada in the semifinals, 4-2, behind sensational goaltending from Noora Raty. The U.S. smashed Russia, 7-0 to set up the final. The U.S. dominated the game from the outset, making it hard for the Finns to even get possession in the first two periods. Even with a 17-4 edge in shots in the first period, the game was scoreless thanks to brilliant work from Raty. The Americans killed off two penalties in the second period, but maintained the pressure. The U.S. finally got a goal with 4:14 to play in the second period, thanks to more good checking. Off a scrum in front of the U.S. bench, the puck popped forward and onto the stick of Annie Pankowski at full speed. She had space to send a rocket toward the Finnish goal and it flew past Raty’s pad for a 1-0 lead. The goal made the game more intense for the Finns, who launched attack after attack into the U.S. zone. With 1:31 to play, a cross-ice pass from Petra Nieminen found a wide-open Susanna Tapani, and she found the net with a screamer that Alex Rigsby could not stop. 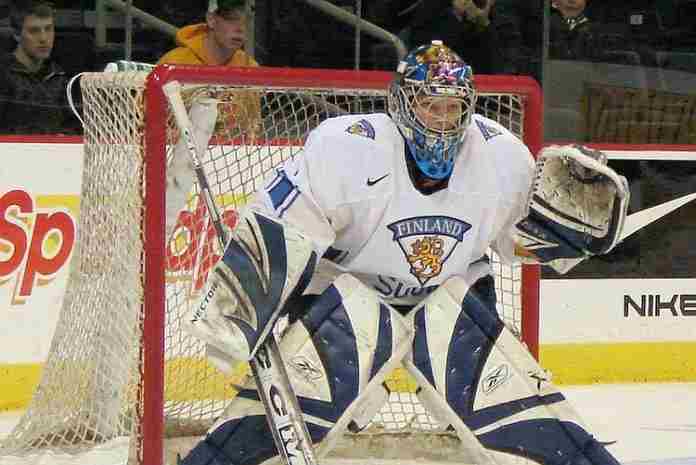 The Finns out-shot the U.S., 10-7, in the period. The third period was more of the same: physical. Both sides made strong rushes at goal, but the U.S. controlled the action and had a 13-4 edge in shots (and 37-18 in regulation). But they couldn’t get the puck past Raty and the game went to 4-on-4 overtime. In the extra period, the U.S. got a power play, but Hilary Knight hit the post and the game continued. Even though the American offense dominated play, Finland got a break-out with 8:27 remaining, and after a Rigsby save, Nieminen buried the rebound in the U.S. net, setting off a wild celebration from the full house of 6,053 at the Metro Areena, on and off the ice. The play was reviewed immediately, and at length, and the goal was waved off due to a penalty call – prior to the shot – against Rigsby. After all the explanations and a 12-minute delay, play resumed with a Finnish power play. The U.S. killed it, but after dominating play for another six minutes, the U.S. was called for another penalty with 1:54 to go. Another penalty kill and the overtime expired, and the exhausted teams – and crowd – advanced to a shoot-out. Could the U.S. get anything past Raty? Was Rigsby up to the test? Michelle Karvinen missed wide to the left on the opening shot, but Amanda Kessel faked Raty to the right and scored between her pads for a 1-0 lead. Ronja Savolainen’s shot was saved by Rigsby and Pankowski also deked Raty and scored for a 2-0 lead. Now, Minnamari Tuominen had to score and she ripped a shot past Rigsby’s right shoulder to narrow the deficit to 2-1. Both Alex Carpenter’s and Hilary Knight’s shots were saved by Raty, so it came down to the fifth try for Finland by Tapani, and her shot was saved easily by Rigsby, giving the title to the U.S. for the fifth straight time. It was, in a word, unbelievable. Finnish defender Jenni Hiirikoski was named Most Valuable Player and the Best Defender; Kendall Coyne Schofield of the U.S. was named Best Forward, and Raty was – to the surprise of no one – was Best Goaltender. The All-Star team voted on by news media included Raty in goal, Hiirikoski and Cayla Barnes (USA) on defense and forwards Knight, Coyne Schofield and Finland’s Karvinen. Knight ended up as top scorer with 11 points (7 goals + 4 assists), followed by Canada’s Natalie Spooner (10: 6+4) and Hiirikoski (10: 2+8), then Coyne Schofield (9:5+4) and Canada’s Brianne Jenner (9: 3+6). Final Standings: 1. United States; 2. Finland; 3. Canada; 4. Russia; 5. Switzerland; 6. Czech Republic; 7. Germany; 8. Japan; 9. Sweden; 10. France. Semis: U.S. 8, Russia 0; Finland 4, Canada 2. Third: Canada 7, Russia 0. Final: U.S. 2, Finland 1 (shoot-out).